Welcome to the NBA 2K13 portal! 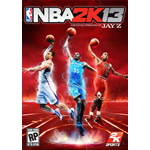 This is a central hub for all the NBA 2K13 content here at the NLSC including news, reviews, feature articles, downloads and more. In this week's Friday Five, it's part ten in a series of lists of retro teams that Andrew would like to see added in future NBA 2K games.